New Delhi: The first day of Chaitra (March-April) month happens to be celebrated across Jammu and Kashmir as Navreh or Kashmiri New Year. The auspicious day is widely celebrated by the Kashmiri Pandit community where people greet everyone they meet with a warm ‘Navreh Mubarak’ (Happy New Year)! Navreh is derived from the Sanskrit word ‘Nava-Varsha’, meaning New Year. 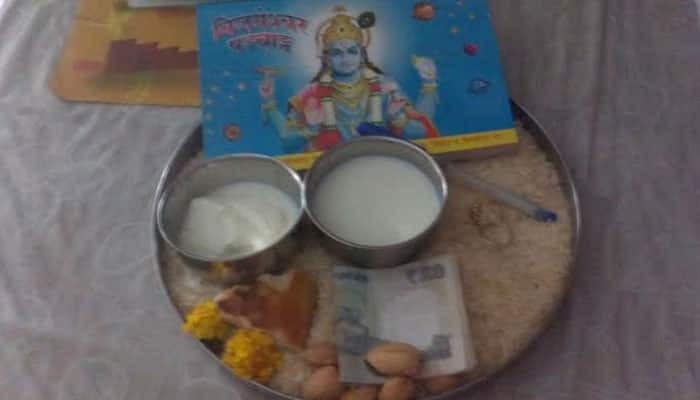 There is a customary practice of preparing a plate full of unhusked rice with a bread, a small bowl of yogurt, salt, sugar candy, a few walnuts or almonds, silver coin and Rs 10 note would also do, a pen, a mirror, some flowers (rose, marigold, crocus, or jasmine) and the new panchanga or almanac. Also, one has to keep Kashmiri Jantri (a panchang book which has an account of all the important dates as per Kashmiri tradition). Interestingly, all of this is prepared during the night itself as the first thing in the morning is to look at this plate, and then start your day. Kashmiri Pandits observe the same ritual of preparing the plate and looking at it in the morning on Sonth or the Kashmiri spring festival. As per Kashmiri Hindu calendar, the Saptarshi Era is believed to have started on the same day, about 5079 years ago. The legend has it that the celebrated Saptarishis flocked together on the Sharika Parvat also known as Hari Parbat in Kashmir—revered as the divinely abode of the goddess Sharika, at the auspicious moment when the first ray of the sun fell on the Chakreshvara on this day and paid tribute to her. On Navreh, Kashmiri Pandits visited the Hari Parbhat shrine to seek goddess Sharika’s blessings. Also, kids wear new clothes to mark the New Year and so do the elders!